The Mighty Thor Dice Masters Draft Pack Opening — GamingWithSwag.com - Dads By Day, Gamers By Night. 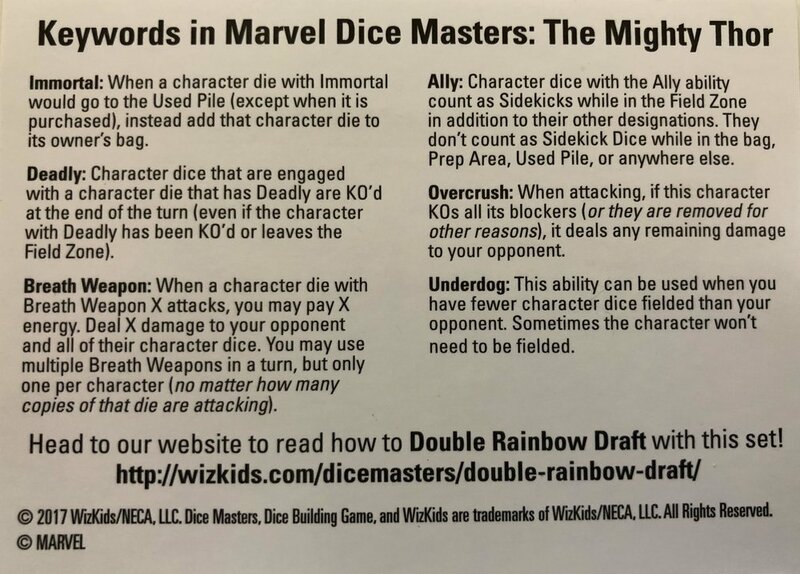 Wizkids is bringing their Dice Master draft packs to the Marvel universe with The Mighty Thor Draft Packs. Like the Dungeons and Dragons sets from Tomb of Annihilation, these packs are $10.00 and come with 24 dice and 14 cards with mixed rarity (two cards will be rare or even Super Rare in each pack) and from which you will draft a team with friends. 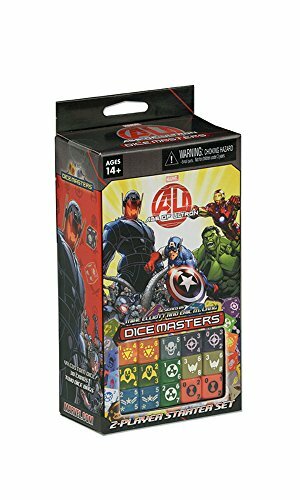 You will need items from a starter kit to play so you have the starting sidekick and action dice, but otherwise this is a perfect way to introduce someone to Dice Masters or to challenge yourself to make teams while increasing your collection. Below we show the teams that Chris and I drafted which does include a Super Rare and you can check out a video of our draft to see it happen live. If you used to draft with the single packs I have to say this is much better with guarantees of at least two dice for any card selected and ensured rarity for more fair drafts among competitors although if they draft poorly...well that's on them. This is Chris' team and he focused on getting 4 dice for Wrecker and Mr. Fixit because he is a giant Wreck it Ralph fan. Otherwise his team is garbage but he has a few sweet rare cards like the Punisher up top that deals damage to your opponent anytime your die takes damage during the opponent's turn. This team was drafted brilliantly, I mean you have a good scale of power with characters at every cost from 2-7. A lucky Super Rare pull of Earth X Machine Man puts the team over the top, but even without him Surtur can be devastating and my combo of Volstagg with his ax Jarnbjorn and his buddy Fandral couldn't possibly be stopped. Here is the included terms and abilities utilized in this new set. If you need a starter kit to jump into the action I recommend the Age of Ultron set as it is currently the cheapest Marvel starter on Amazon and will have some characters that would more logically interact with the god of thunder. But these deep into the line's history you have a bunch from which to choose.